Wilson and SCBI officials recently signed a memorandum of understanding outlining the intent of a five-year partnership that was suggested by Wilson alumna Susan Breakefield Fulton, a longtime supporter of both organizations. Fulton, of Washington, D.C., proposed that the college and SCBI team up, and made contributions to both organizations to help launch the partnership, according to Camilla Rawleigh, Wilson’s vice president for institutional advancement. “Susan’s been very generous over the years to nonprofits, but there were two that really stood out to her — SCBI and Wilson,” said Rawleigh of Fulton, a 1961 Wilson graduate whose interests include environmental sustainability and the welfare of animals. SCBI plays a leading role in the Smithsonian’s global efforts to save wildlife species from extinction and train future generations of conservationists. 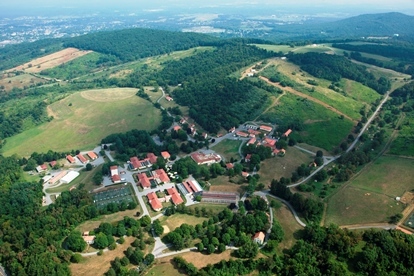 SCBI spearheads research programs at its headquarters in Front Royal, Va., the Smithsonian’s National Zoo in Washington, D.C., and at field research stations and training sites worldwide. SCBI scientists tackle some of today’s most complex conservation challenges by applying and sharing what they learn about animal behavior and reproduction, ecology, genetics, migration and conservation sustainability, according to institute officials. The partnership between Wilson and SCBI will draw on mutual strengths and interests of both institutions, allowing Wilson students to be exposed in their first year of college to the work being done at SCBI, whose 3,200-acre Front Royal campus is just 90 miles from Chambersburg. Stressing that details have not yet been finalized, Wilson Professor of Biology Dana Harriger explained how the partnership might work for Wilson students. He said in a student’s first semester, they would be introduced to the discipline of conservation biology through their first-year seminar, which would include an introduction to SCBI. Students in the program would enroll in specific collaborative courses in their sophomore year to expand their knowledge of conservation biology. “The goal would then be for the students in this program to study in residence for a semester in Front Royal at the Smithsonian-Mason School of Conservation Biology,” Harriger said. Jointly operated by SCBI and George Mason University in Washington, D.C., the Smithsonian-Mason School of Conservation Biology is the on-site education center at SCBI. As part of Wilson’s established, undergraduate research sequence, students in the program would be mentored by SCBI scientists and faculty at its education center, as well as have an opportunity to use the institute’s laboratories and other facilities, according to Harriger. The partnership would also benefit Wilson faculty members, providing an opportunity for faculty exchanges in which Wilson professors might teach classes at SCBI’s education center. Likewise, faculty from SCBI could teach an occasional course at Wilson, Harriger said. “At the end of four years, the students enrolled at Wilson would fulfill the requirements for their biology degree, focusing on conservation biology, and they would have the experience of working with top-notch research scientists from the Smithsonian,” said Harriger, who sees the partnership as an incredible opportunity for Wilson, SCBI and in particular, Wilson students. More information about SCBI can be found at https://nationalzoo.si.edu/conservation.